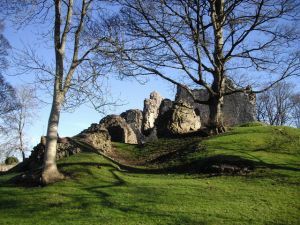 Llanblethian Castle is a ruined rectangular castle built around 1102 on a steep-sided spur of rock overlooking the River Thaw. The castle enclosure measures some 64 metres long and 30-40 metres wide. The first fortification was probably the work of Herbert de St Quintin, and consisted of little more than an earthwork bank and ditch with a timber palisade. A rectangular stone keep was added in the late 12th century, but the first written record does not come until 1234. The early fortifications were strengthened in the 14th century with the addition of a twin-towered gatehouse and a pair of eastern towers. The estate was seized from the St Quintins by Richard Siward in 1233, but when Siward was declared an outlaw in 1245 the estate passed to the powerful de Clare family, Lords of Glamorgan. Sometime around 1307 Gilbert de Clare the Last (d. 1314) began the construction of the stone castle we see today. De Clare died at the Battle of Bannockburn in 1314, and it seems that the castle was never completed. It later became one of the residences of the Lords of Glamorgan, and was used as a prison in the 15th century, but it fell out of use by the mid 18th century and by the late 19th century the castle had decayed so badly that it was being used as a cowshed. JMW Turner painted the romantic ruins of Llanblethian, and the painting is now held in the Leeds Art Gallery. The best remaining feature is the twin-towered early 14th century gatehouse erected by Gilbert de Clare. This site is also sometimes called St Quintin, or St Quentin's, castle.